This RSEvents!Pro iDeal Payment Plugin is commercial and needs to be purchased separately. The price of the plugin is: 9 EUR. You can buy it by accessing Customer Area > My memberships > Active Memberships > clicking the 'Buy Extra Plugins' button of your RSEvents!Pro license. The iDeal Payment Plugin enables you to process your transactions through the iDeal payment processor. This plugin is sold separately, along with the other RSEvents!Pro payment plugins. After purchasing the Payment package, you can download the plugin from Downloads >> My Downloads >> RSEvents!Pro >> click on 'view all plugins and modules' >> RSEvents!Pro Payment Plugins >> iDeal payment plugin. Installing the plugin is done via the standard Joomla! installation procedure. You can read more on this topic here. Tax Type: you can choose whether to apply a fixed tax or by percentage of the full price. Tax Value: The value for the previously set type. iDeal account: a drop-down menu containing all supported iDeal account types: Mollie, ING Basic, ING Advanced, Rabobank Lite, Rabobank Professional, ABN AMRO Easy, TargetPay and Sisow. iDeal ID: Here you need to specify the iDeal ID to which the payments will be transferred(For example if you are using Mollie, you will have to add your Partner ID). After subscribing to the event, the user will have to select his bank and will be redirected to that bank's page where he will fill his payment details. 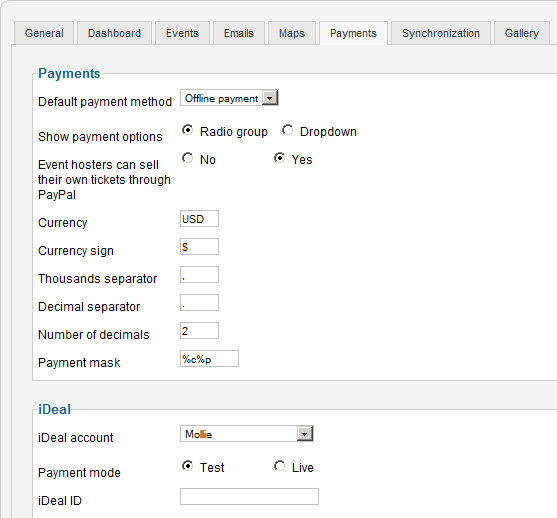 After the transactions is processed, the user will be redirected back to the event page. The iDeal payment processor is only available for the Netherlands. For more details, click here.